First Mario title with paid-for extras. 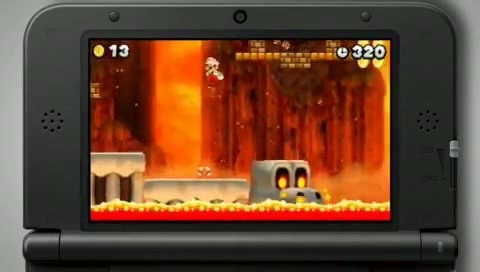 New Super Mario Bros. 2 for 3DS is Nintendo's first Mario game to offers downloadable content. Paid-for extra levels will be made available after the game launches, European Nintendo president Satoru Shibata announced earlier this morning, during the company's Nintendo Direct conference. But DLC development will not begin until the main game is finished, Shibata assured fans. This means that pricing and release details for the DLC will be announced at a later date. The extra levels will be added to the game's new Coin Rush mode. Separate to the game's main story, the additional mode offers players three random maps to mine for money. Coins collected will be totted up across the three levels, and your total will be shared via StreetPass for others to beat. See the mode in action in the new trailer, below. It's not the first 3DS game to offer DLC, however. Square Enix's Final Fantasy: Theatrhythm will beat Nintendo to the punch in Europe, while Fire Emblem: Awakening has been offering extra content since its Japanese launch in April (but will not arrive here until next year). The year of Birdo commences? Shares jump on positive Christmas. But "no inclination" to change Mario or Pokémon.